The move would enable the government to cut its stake in much the same way as it did with former phone monopoly Telkom SA, almost two decades ago, said the people, who asked not to be named as the information is not public. However, the carrier would first need to make progress with a turnaround plan designed to reach break-even in three years, they said. While the sale of a stake to an equity partner has been aired repeatedly over the years, this is the first time it’s been suggested that SAA should list on a stock-exchange. Pretoria-based Telkom’s initial public offering in 2003 raised almost $500m and the government’s shareholding is now just under 40%. 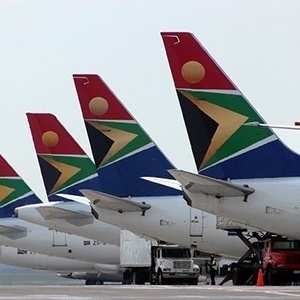 The airline’s Chief Executive Officer Vuyani Jarana is facing renewed pressure from his bosses in government, which last month put aside R5bn to help SAA repay debt. SAA will also consider a resumption of flights to Abuja, the Nigerian capital, which it abandoned in 2017, the person said. The carrier would apply for a local license - or find a partner - to help Nigerians travel to the U.S.
Jarana, 48, a former executive at South African mobile-phone market leader Vodacom, was hired a year ago, in part for his experience in the private sector. He also has no connection with previous management, which has been embroiled in the corruption scandals that plagued state-owned companies during ex-President Jacob Zuma’s almost nine years in charge. SAA fired its former CEO and chief financial officer in June after finding them guilty of misconduct, while former chairperson Dudu Myeni has also left. Under their leadership, SAA failed to properly value assets or correctly record irregular or wasteful expenditure, according to an Auditor General report released earlier this year.